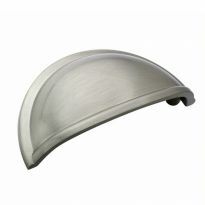 The perfect wall bed hardware for guest beds, small rooms, dorms and apartments! 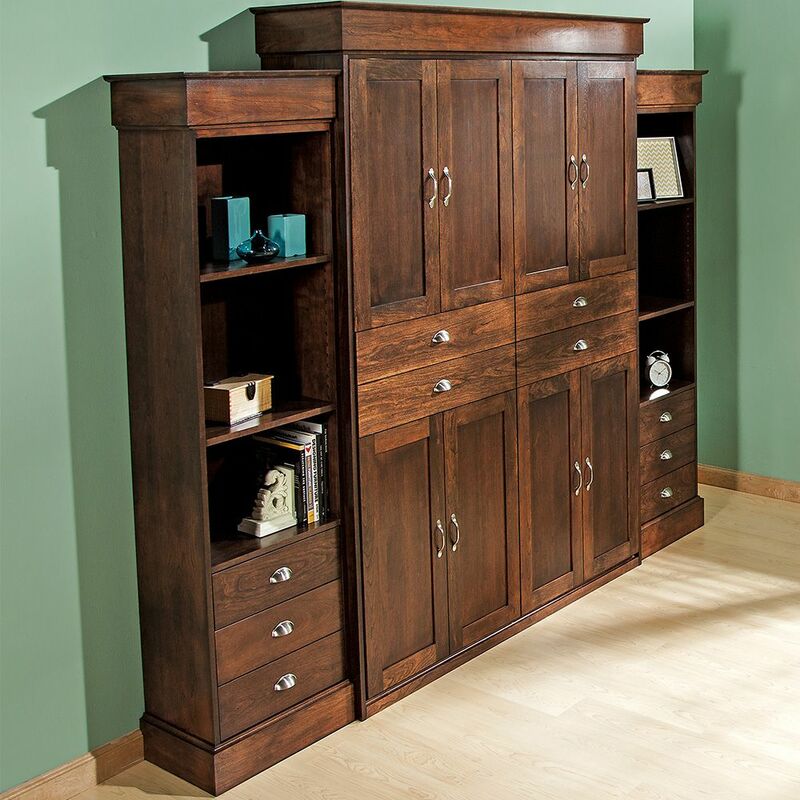 Download the Free Full or Queen Plan below for creating a stylish bookcase to complement your Murphy Bed cabinet. (Not required for basic cabinet construction). These Deluxe Murphy Bed Kits include all of the necessary hardware included in our standard kit plus a pair of folding metal legs that support the end of the bed when it's folded out, and tuck neatly inside the bed when stored. One tug is all it takes, and the bed folds out smoothly and silently on state-of-the-art gas pistons. The folding bed hardware is finely engineered, counterbalanced for smooth operation without binding or overextending, and uses a sophisticated piston lift system rather than old-fashioned springs that can break and slacken over time. The beds are held securely closed, and open gently for safety. Steel pivot pin and bracket points install easily without adjustments. Includes instructions for basic cabinet construction and instructional DVD. Hardware available in Twin, Full or Queen sizes. For horizontal applications, see our Side Mount Deluxe Murphy Bed kits. 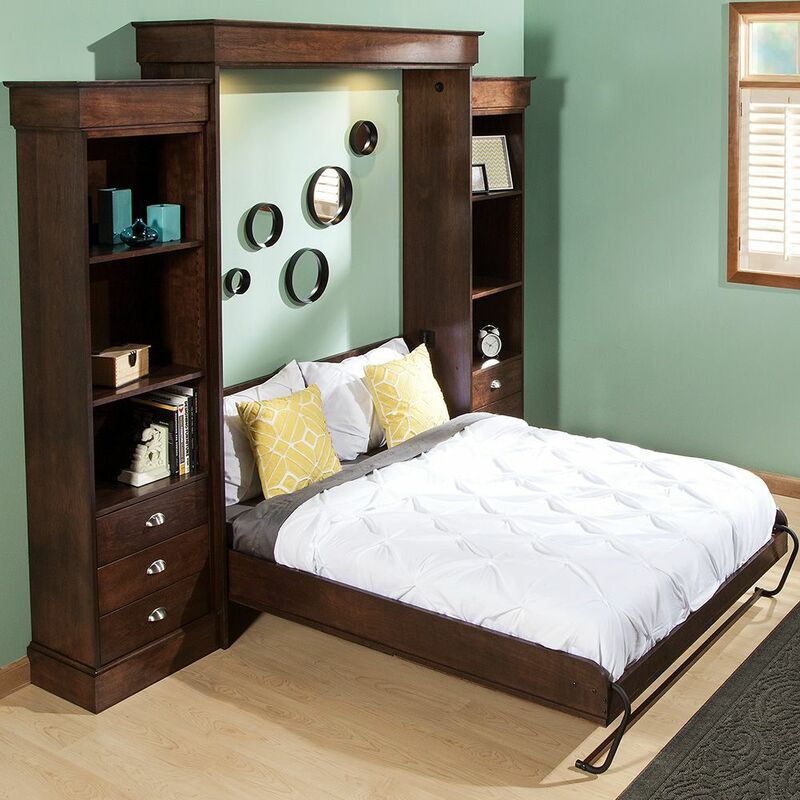 Deluxe Murphy Bed Hardware Kits include folding tube legs, which are totally concealed inside the bed cabinet when it is closed and are manually rotated over the end of the bed face panel when it is lowered out of the cabinet. State of the art piston lift system and counter balancing ensure smooth operation. Kit includes step by step instructions for building a basic cabinet and mounting the hardware. Additional plan for bookcase (pictured) is sold separately. No floor mounting required; Cabinet must be anchored to the wall to ensure safety. 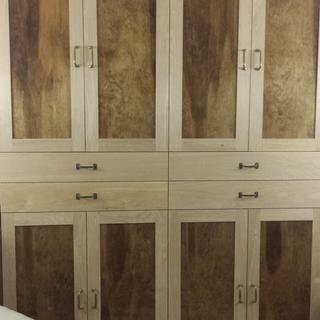 Cabinet can be made of plycore, particle board or solid wood. Recommended for standard mattress sizes; no box spring is used. Free plans are designed only to work with the hardware kit mentioned in the plan. 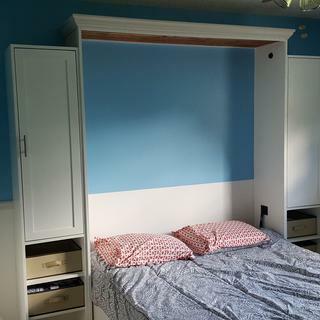 It took 5 months of evenings and weekends to design and build this queen sized vertical Murphy bed. The directions were easy to follow, and I could knock out a couple of steps at a time when I had a spare hour or two. I added overhead lighting and the ability to disassemble and remove from the wall if I ever move. I used ¼" cherry, ?" 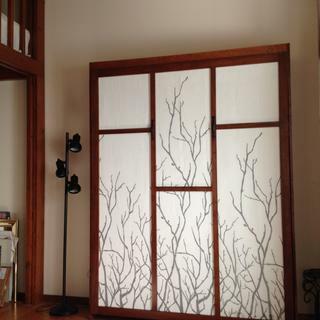 baltic birch plywood & stained glass for the fake cabinet. 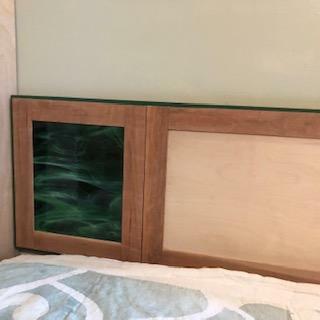 Biggest changes were the cabinet design, 4" rather than 6" moulding and I moved the headboard up several inches so it wouldn't be covered by the mattress. 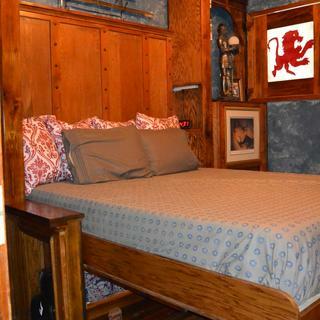 Headboard is also mounted about an inch from the wall to give some space for wiring and light switch to be mounted. Fake drawer & cabinet handles were bolted in to the back using fender washers & locking nuts, so they won't come loose. I'm quite pleased with the result. Well made components, excellent instructions, and very helpful dvd. Recommended highly. Installation was easy. Everything is of high quality. The bed opens and closes easily. This hardware was easy to use on our recent Murphy bed job. Thank you.Great quality. Fast shipping. Great product. Went together very well, customer happy. Staff at Rockler very helpful . Would recommend this. 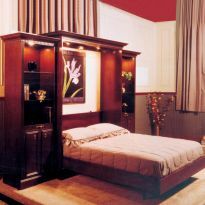 I researched a few different brands and types of Murphy beds then chose the Rockler brand. Both for its construction materials and the abundance of free and simple to understand instructions and drawings. I was able to look the plans over, get a materials list to determine an estimated cost, all without spending a dime. 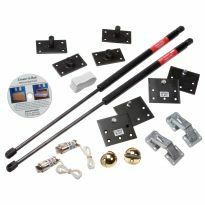 I would highly recommend this or any of their kits to anyone with basic carpentry skills. 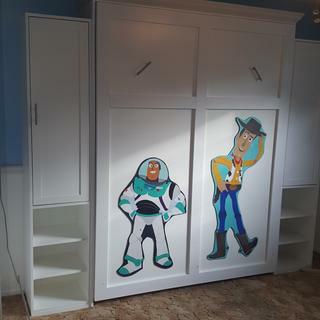 I used the plans from a different kit to add the two side cabinets as this bed was installed in the baby’s room as a guest bed. Quality hardware, good directions, a little expensive for what it is. 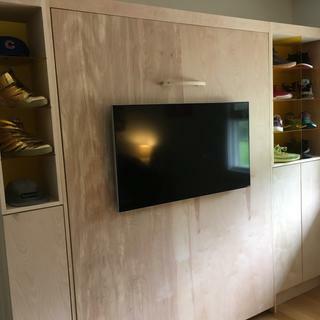 Very simple, took me a day to cut out plywood and install hardware and sand and seal. The next day to build the bed platform and finish on exposed side. Took an hour to set it all up in the cabin it was going to be for. Working perfect. 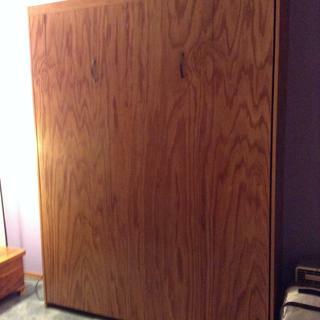 This is the second Murphy bed I have madel The plans are thorough and easy to follow. This kit is awesome and with the extensive, accurate, and very complete cut list, it goes together as described in the plans. The video is well done and follows along with the instructions. I referred back to the video before each major step. Make no mistake this is a LARGE assembly when finished. I almost made the mistake of putting it together in my basement - it would have been impossible to get out! Working with 4x8 sheets of plywood or melamine on this project, I discovered how heavy they are to move around and cut accurately. Very impressed with how the whole project came together. I’ve now built 2 Murphy beds with these hardware kits. The detailed plans and instruction videos are easy to follow. Finished beds are functional and solid. My wife and I got a little creative with the cabinet faces. One is covered with fabric curtains, the other a duvet cover. So far so good. I have to work on the wooden parts yet!!!! Excellent product with great plans and instructions. Built the bed exactly as recommended, but modified the side cabinets to include a paneled cabinet door instead of the drawers. 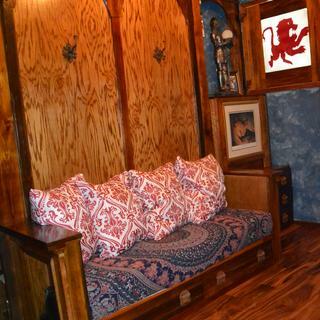 My Murphy bed is everything I wanted. One suggestion--update the instructions to include that when installing the hardware for raising and lowering the bed to use lock-tite on the screws. The hardware can come loose, and although it can be retightened, it is a lot of work. You have to remove the mattress and the plywood top to get to the screws. This is our 3rd Murphy bed & we are getting ready to enjoy it. They are perfect for guest rooms. Our guests have never complained about the comfort. Instructions for the Queen size Vertical Kit were clear and concise and the hardware performed exactly as it was advertised. I will construct additional Murphy Beds and purchase more mechanisms for my business. My customer was completely blown away at the results. I really didn't know much about murphy beds or the hardware but the concept seemed like a great solution for a guest/optional use spare room. The plans and the hardware were all spot on and great quality. 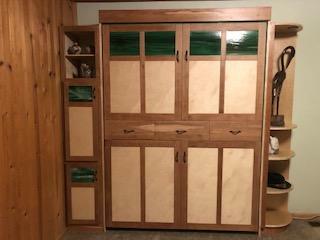 After a year of shop cabinets I felt ready for a furniture project, and this is a good one for intermediate level DYI'ers. 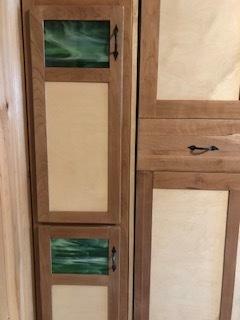 Next up the side cabinets.PS: Rockler has a very knowledgeable Murphy Bed tech, she was great answering a question or two on some customizations I made. 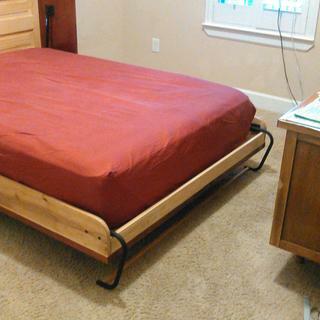 I am about 3/4 of the way to completing the bed bout so far I can say that the hardware seems well made and complete. I am pretty happy with the cut sheets and the instructions. I also am happy to have the CD to refer to. The instructions were clear & easy to follow. Cutting the large parts would be difficult if you don't have the ability to make straight & square cuts in 3/4" thick plywood (heavy!). Good plans provided and hardware works well. I am highly satisfied with the queen size Murphy bed kit I ordered. It was shipped quickly, arrived in good condition, and had very easy to understand and follow instructions. Building it was very easy and enjoyable, and it turned out great. GREAT kit with quality setup. Thank you for the video as well. My friend, a contractor had no problem putting it together. Love the bed! The direction packet is clear and comprehensive. I am working on building the bed now. Thank you. Excellent produce. You really need to do everything exactly like the instructions. Only things I changed were I installed pocket holes on some parts instead of putting screws on the side. Love the new Murphy Bed! At this time I am only about 3/4 through construction. I have found the instructions to be very detailed and accurate and advise any builders to review them several times to become semi familiar before starting construction. So far so good, can't wait to finish. I had more scraps than I expected. I think 3 sheets of 3/4 would have worked. 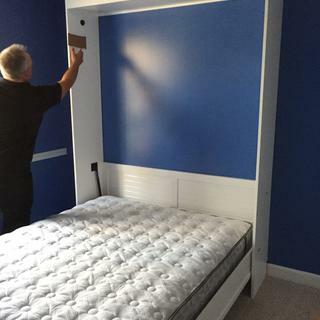 This was my first experience building a Murphy Bed. I bought the Deluxe Murphy Bed Hardware and followed the instructions to a "T" and no problems. Everything fit perfectly and bed works like a charm. I would highly recommend to anyone with some experience and the required tools. It was fun. This kit was a fun project for me. The hardware was good quality, and the instructions were very clear. Very easy to follow. I installed my bed into a closet in my office. Nice bed when you have company. I used a 8" foam mattress and it was heave enough to hold the bed down. 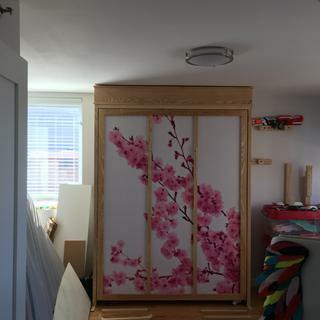 I am building my second bed, with my own custom cabinets on the sides. One thing that's nice is that there are absolutely no errors in the detailed plans that come with the hardware. The hardware kit is of good quality and works well. 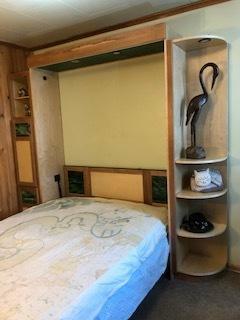 I have a small house and was tired of using an air mattress for guest...decided it was time to install a murphy bed. Was very pleased with the hardware and instructions. We kept it simple, and may add the bookshelves at a later date. It's been holding up fine...so far very sturdy. The quality of the product. attention to detail, helpful instructions and access to assistance truly restores my faith in products produced in the USA! Follow the instructions and you'll build a great bed with ease. I bought the deluxe full vertical Murphy bed kit. The shipment arrived promptly, the kit was packed well and was complete. I'm impressed with the quality of the hardware. The instructions were thorough and complete. I followed them precisely and the bed turned out exactly as Rockler advertised. 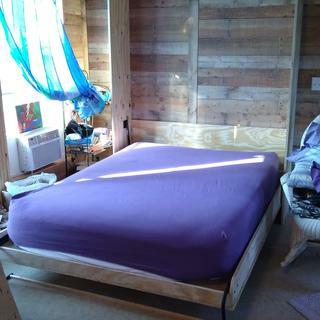 It took me 4 6-hour days to buy the materials and finish the bed. I am not a carpenter and I've never built furniture before. I must like them I have made 8 of them. Nice and easy to work from the instructions given . I would highly recommend this product , keep up the great work . I would definitely recommend this product. I am a 5 foot tall woman in my 60s. I did this myself, after Lowe's kindly and accurately cut all my wood. It was kind of like putting a quilt together, only heavier! I should mention that my husband helped with the heavy lifting. Your instructions were my key to success. Thank you! We make murphy beds for a living and this hardware is easy to use compared to the old spring method. Great product. My only suggestion would be to state in the written instructions when to put the edging on. It is not very clear and can make a difference in measurements, though probably no significant. Queen bed functions very smooth. So far very happy with the bed. Building the bed went very smooth. We downloaded and printed the Deluxe bed plan, that had more helpful info in it. 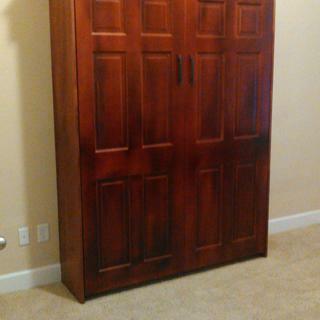 This is the second Murphy bed I have made with this company. The instructions were completely clear and concise, and for a non-professional, that is so appreciated. I have recommended these kits to so many people. Thank you for such a great product! Have completed two of these. Following the instructions carefully there were no problems with installation. The second one has an adjustable feature which wasn't well explained in the instructions; this bed is in daily use for 10 weeks now without a problem. The first one has also had no problem for six months now, but is used infrequently. The hardware, bed plans and video were all outstanding. The bed actually turned out better than I expected. I will definitely recommend it to friends. I am not a professional woodworker, just a 50 something woman with some common sense. The bed works BEAUTIFUL and thanks to the DVD, it really was not that hard to do. My neighbor helped me with the final installation and thanks to his smarts, we finessed it into place. Love how it works so easy!!! Plus I accidently bought a mattress that was 1.5 inches thicker than they suggested, but called and they helped me make the adjustments to the plan. Very helpful! Used the standard system previously and looking forward to the additional support bar. Looking to still have a spare room without taking up all the space in the room. All the positive reviews posted. Liked the look and the design. There are a lot of plans and less expensive systems available, but this is the safest and most efficient mechanism I could find. Downloadable plans are very thorough. Thanks. Have used it before. This is my second build. Liked the materials and design. Used this hardware twice before successfully. Highly recommended by friend who installed one! Moving into my basement shop while the upper two floors of my home are being remodeled..this is a good tuck away sbed so my valuable shop space is still functional. I built one before and am happy with it. Now to turn a bedroom into an arts and crafts space. Saw information about how to make a Murphy bed in the magazine Handyman. They indicated they got the hardware from you. We have a spare bedroom that we also use as an office. We have cats who like to sleep on the bed, so every time we have company, we have to wash the bedding first. With a folded up murphy bed, the cats will not be able to lay on the bed when we do not have company. This item was highly suggested by a friend of mine. I decided to get one thereafter. She said it really helped with extra visitor accommodation while maintain an uncluttered space overall. This item fit my needs and had many good reviews and was priced competitively with other similar products. Friend recommended, and many good reviews! This is the first of what I hope will be many Murphy Beds in our house. Rockler seems to be the best option on the market but we'll see when it gets here and I begin the building process. 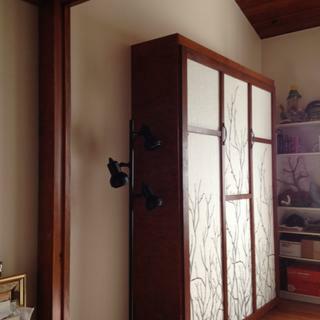 The woodworking design is beautiful, with easy to follow instructions. I'm having fun making the cabinet, and cannot wait to complete it. 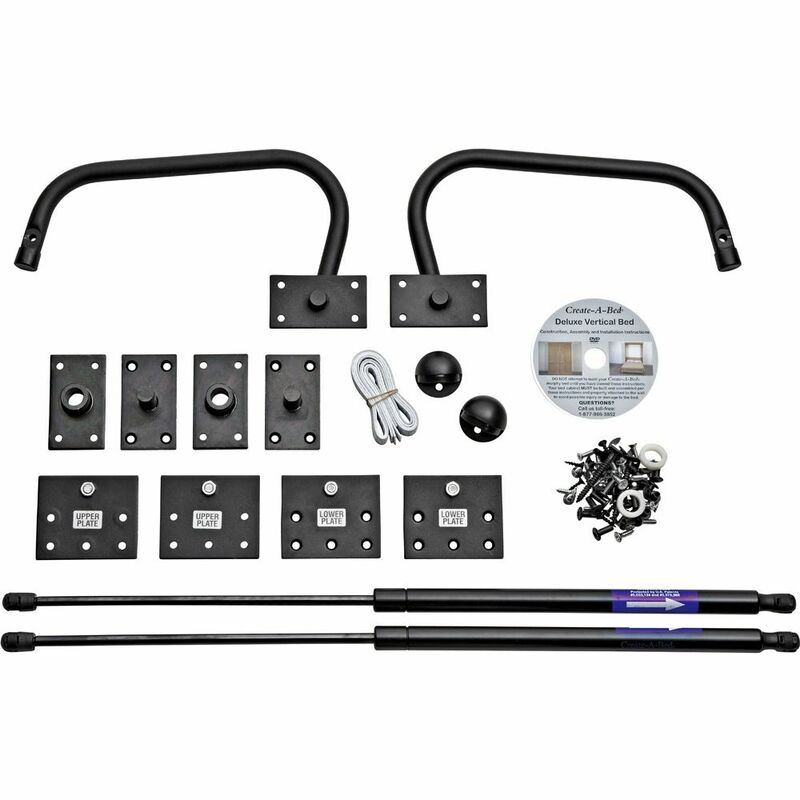 I selected this same bed hardware kit in 2011. The kit and the great instructions which come with it helped us build a fantastic bed which we use all the time. It is worth the money. Great reviews to add bed for children & family visiting periodically. Like the deluxe kit with the steel support frame better than the wood "pegs" on the standard kit. 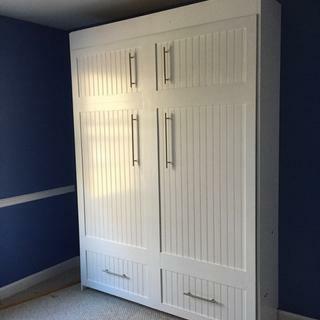 Reviewed many Murphy bed hardware sites online and determined Rockler had the best product, reviews, and price. in order to utilize an used space in my house. I'm remodeling my guest room and a Murphy Bed is a KEY component. Big project. I'm looking forward to it. I picked this item because I occasionally need a guest bed. 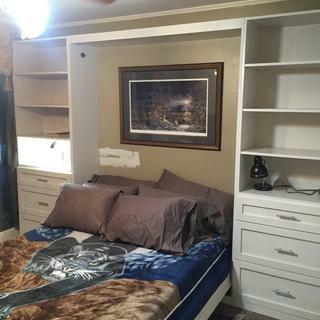 With a murphy bed, it is on the wall and out of the way until it is needed! We were looking for a good solution to having a guest bed without taking up too much space. We downsized and are living in a smaller home, so space has become a valuable commodity. built my first bed with the older kit and cant wait to try this new design. Best priced and quality hardware out there. The comments on the website for this product was very good. 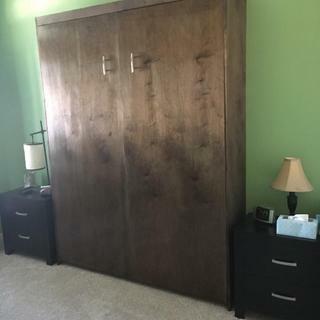 Brother has built his own Murphy bed and we need a unit that will not take up too much space in a small spare bedroom, for occasional guest use. it should fit in the area i need for a guest bed. Great reviews and it sounds like this is the quality product we were looking for. Also have kept an article from the Family Handyman from Dec/Jan 2015 that I always wanted to do and they suggested your product also. 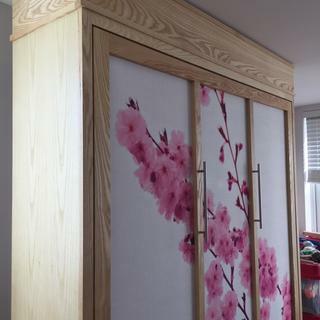 I used this kit to build a Murphy bed at our last house and really liked how it turned out. I chose this item because of all the wonderful reviews. I have been researching this for quite some time. This looks like the best option. Looks exactly like what I needed for saving some room in the bedroom ,slash, hobbyroom. The space available for the room. Is going to be my guess room. I can use the space available when exercising. Needed to turn an office into office and guest bedroom, this will fit into 8.5 x 10.5 room nicely. My builder had purchased this same product for another client and was pleased with it's functionality, so he suggested it to me. Looks like a quality DIY Murphy Bed Hardware kit. Building one for my daughter. 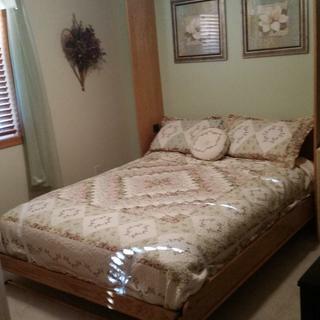 I need to make a bedroom into a sewing room, yet still have a bed for guests! We are trying to turn a spare bedroom into both an office and a guest room. A Murphy bed will help keep the space functional as an office space when we don’t have guests. What extra costs will I need to build the basic vertical murphy bed? BEST ANSWER: The materials needed to build a Full or Queen Vertical murphy bed can be found at any large home improvement retail store and will total approximately $400. These materials will include four 4x8 foot sheets of veneered plywood, two sheets of inexpensive 1/4-inch thick plywood, 65 feet of solid wood, 80 feet of veneer tape, screws, and nails. You can use any mattress that is UP TO 12 inches thick (including any pillow top) and weighs between 50 and 65 pound for the Full and between 65 and 80 pond for the Queen. You can call the manufacturer with any questions or for Technical Assistance. My costs were closer to $,1,500. I also live far from hardwood forests so lumber costs more. I have 84" from floor to ceiling. Will the bed hit the ceiling when I open it? I would like to install a full size bed vertically. BEST ANSWER: The rock bottom height that you can have is 82-1/8". The free downloadable plan calls for 85-7/8" height. The plan could be modified at the top to work with you ceiling height. How are you calculating the 82-1/8? I know that the hardware states that I have to have no more that a 12 inch mattress. 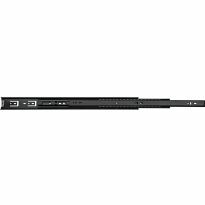 Is there anyway that I can fit a 14 inch mattress on this hardware or is there hardware that I can get that will fit a 14 inch mattress? 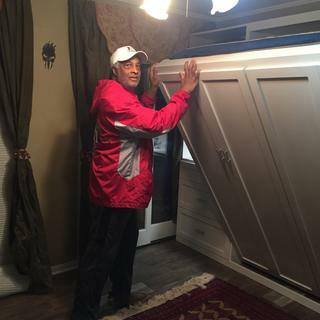 BEST ANSWER: The Deluxe Create-A-Bed Murphy Bed Kit calls for a wooden Leg Support Rail that is connected to the legs and acts as a "handle" to rotate the metal tube legs from inside the cabinet over the end of the bed Face Panel Assembly when the bed is lowered for use. If you use a mattress that is thicker than 12 inches, you should ADD DEPTH to the bed cabinet and ELIMINATE the wooden Leg Support Rail. This means that you must be sure to fully rotate BOTH LEGS over the end of the bed Face Panel Assembly. If you call C.A.B, Inc., we can tell you exactly how to modify your cabinet to accommodate your thicker mattress. The 12 inch max depth is based on the depth of the cabinet called for in the plans. I suspect that you could increase the depth of the cabinet and so long as the relationship of the hardware for the gas pistons in relation to the mattress box remained the same, and it would work just fine. The bottom line is that you would have to diverge from the current plans. How high does the bed rest off of the ground? What is the leg height? 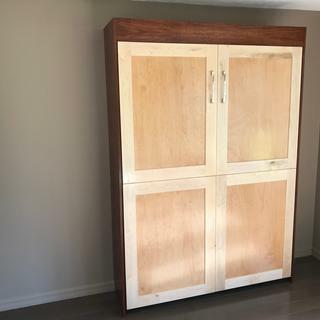 I am wondering if I can build some sort of seating on the front that will use the vertical Murphy bed as a back rest but will act as additional support when the bed is folded down. BEST ANSWER: The leg is about 7 inches so that will be your ground clearance. I'm in the process of doing exactly what you described so I modified the plans. 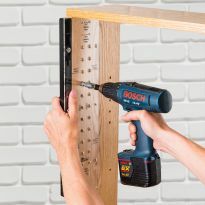 Is you're using 4x8 boards, you can add about 8 inches to the vertical cabinet height and adjust your plans accordingly. This will give you about 15 inches of clearance for the bench height. If you use removable cushions for the bench, that should provide adequate seating height. I should add these above comments were for a queen size bed. Hey Kate, Thank you very much for your reply! I would love to see how yours turns out. We are planning on doing ours in the next month or so and I am in the planning mode. Good luck and Thanks again! The 'legs' are 7" high on the one with wooden legs. With a mattress that puts the surface of the bed at around 23" off the ground. You would need to raise it to at least 17" length legs, putting the mattress at 33" off the ground. My current regular mattress is 30" off the ground and is comfortable for me, but I am 6'2" tall. You maybe could go to a 15" seating surface and put some firm foam cushions on the seats while the bed is up. That is all going to depend on if you have the ceiling clearance to raise the bed that much. The pivot for the bed is only about a foot off the ground. You can run baseboard across the front but not much else. 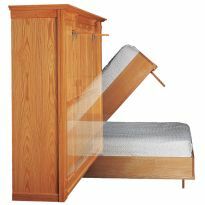 There are two vertical bed items: Item #: 46025 and Item #: 89624. What is the difference other than the price difference? 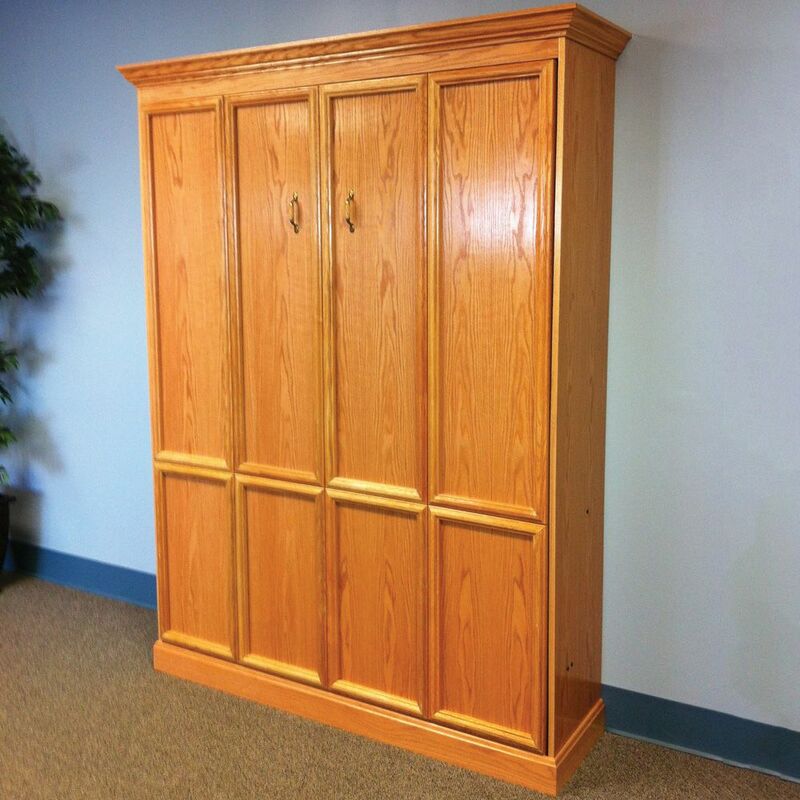 BEST ANSWER: If you refer to the picture of the Vertical Mount Murphy Bed in the closed position you will notice the four decorative elements in the upper panels. Two of these fold out/down to become legs that the bed rests on. The Vertical Mount Deluxe bed does not require these legs. 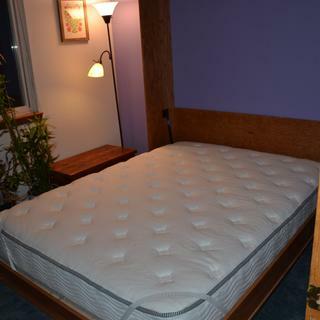 As you can see in the image, it utilizes a fold down leg which pivots around the mattress when in the closed position. when the bed is closed. Is there any kind of a locking mechanism on the deluxe model? I have small grandchildren and can see a potential disaster. BEST ANSWER: There is currently no latching mechanism for the Deluxe model. There is no built in lock, but it would not be hard to add something. I dont imaging you need one, since pulling down the bed you need 1: to be tall enough to reach the handles, and 2: enough strength to pull it. Even though it is easy to lower, it does take a fair amount of effort to start the process. A young child would not be able to reach. How far up the wall (from the floor) is it attached? The attachment points are in the header rail, which is attached at the top of the side vertical supports. I think that makes it about 87 inches +/- from the floor. I don't have the exact measurement but it is around 7 feet. The screws go through a board above the top where they aren't seen. Approximately 7 feet - the length of the mattress plus about 1 foot clearance below and a few inches above for the frame. What weight should the mattress be? We have a 10" memory foam mattress and it is difficult to lift the bed. You can use ANY KIND of mattress - innerspring, memory foam, bed in a box - AS LONG AS the weight of that mattress falls within the ranges listed for the size of the bed you want to build. 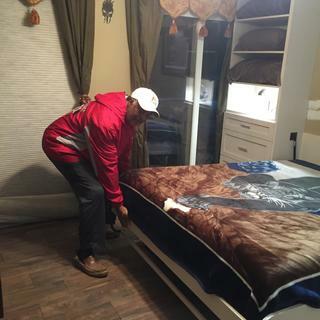 The bed will accommodate a mattress up to 12" with weight between 65 - 80 lbs. If you construct the face panel out of solid wood, manufacturer recommends the frame & panel not exceed 77 pounds. I have a Jamison foam full mattress which is fairly heavy. I plan to build a murphy bed for it and wish to add a desk component to fold off on the face of this kit when closed. I am concerned about the weight of both the mattress and the extra wood on the face to do the desk. Would it be better to buy the queen size kit to accommodate the weight for my full size bed assembly? Has anyone else built a desk fold down/up on the face, and if so, any advice? BEST ANSWER: The mattress weight limit of 65-80 lbs is determined by the size of the gas springs/shocks. They are unable to support more weight no matter what size bed assembly you purchase. 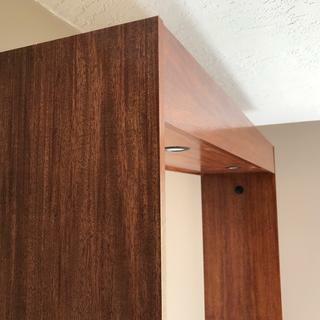 Is there a cut list for the Queen vertical mount deluxe murphy bed kit without the side cabinets? BEST ANSWER: The plans that are included with all the Create-A-Bed Deluxe Kit Murphy Bed Mechanism Kits INCLUDE the cut list and plans to build, assemble and install the murphy bed cabinet. The VERTICAL style kits also include plans for building the OPTIONAL bookcases and plans for adding OPTIONAL Crown, Base and Face Panel molding. Yes, the standard bed Plans and hardware are for the bed alone. 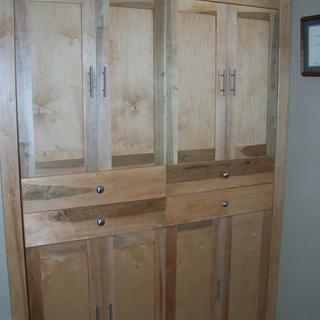 The cabinets aretypically shown but the plans and cut list for the cabinets are an extra that you can purchase. I have made two of these On with the side cabinets and one with the bed alone. The cut list on the rockler site mixes the side cabinets in with the main bed frame. Where can I find the cut list without the side cabinets? do you have a hardware kit for a queen-size metal frame bed? 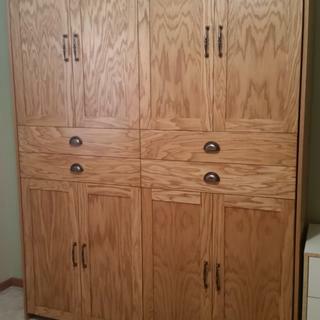 BEST ANSWER: I downloaded the plans for the deluxe queen-size Murphy bed from the Rockler web site. Unless you are going to build the side cabinets I recommend going with the instructions within the hardware kit. 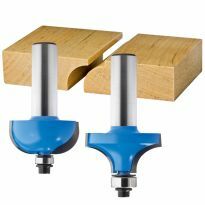 You can get this at the Rockler store or online. It comes with a very easy to understand DVD. It also has all the hardware you will need to finish your bed.The bed itself is relatively simple to cut out and assemble. The final assembly has to be done where the bed is going to be and I recommend at least 3 people and two step stools when you do this. Once you get the get it attached to the wall the bed platform will not stay down until you put a mattress on it. There is a weight limit and I found a great tempura-pedic off brand mattress at Sam’s.I made a few mistakes but overall I like the way it came out and it is very comfortable and sturdy.Good luck.an answer to this question. This kit uses plywood and/or particle board as the bed frame. This particular kit is not really adaptable for a metal bed frame. I purchased the hardware kit for the full size murphy bed. BEST ANSWER: I just spoke with the technical support rep at Rockler's and she said the bed will support up to 1,000 pounds for sleeping. Both my parents slept on it and said it felt very solid (about 220 and 150 lbs). I'd probably advise against jumping on it, but so far its solid as a rock. Hi. I am looking for a piston kit for a Queen size bed that I built with a minimum load capacity of 1700Newtons(~400 Lbs). Can you please help? BEST ANSWER: Rest assured that the (2) c-clips, (2) plastic spacers, (12) silver screws #12x3/4", (18) black screws #10x3/4", (16) T-Nuts and matching machine screws, and (2) Leg Support Rail screws are all provided and should be included in the kit. You provide all nails, brads, and a box each of #8 coarse thread screws, 1 1/2, 1 5/8, and 2". Hope this is helpful. All of the screws and washers needed to attach the supplied mechanisms are included in the kit as well as a instructional DVD. The only screws you need to supply are those for attaching the constructed wood members to each other. I used square drive wood screws readily available from Rockler. Hi there. The only screws you need to purchase are for the bed struts, bed frame and cabinetry 1 1/4" and 2" wood screws will work perfect. 100 of the 1 1/4" and 50 of the 2" will be plenty. The kit I purchased included all the hardware items, including the washers. I want to add a drop down desk to face panels. Also a little larger mattress . Will the gas springs function ok with this extra weight? BEST ANSWER: Sorry, I have not built mine yet, but I have spoken to the manufacturers and they have engineered the system to tight tolerances. IMO if you were to add weight in one way you might want to find a trim area where you can save weight in another . I do see many versions of these with different outer trims. When in doubt I have found the company quite responsive to questions. Hope to build mine this winter. One and a half years ago I added to the basic queen bed design an aged barn wood face as a ski rack which now holds five pairs of vintage skis. There was enough room below the pivot point for the bindings and the tip curl of the skis so that they aren't removed when bed is pulled down. It has worked fine thru many guests. I added two wrought iron handles for safety. It clearly weighs a lot more but adult women and men can lift. Make sure you anchor it well to the wall. They don't make a king size bed for a reason. So I wouldn't go bigger than queen size. As for the desk, extra weight adds to the lifting weight, so the lighter the better. Does anyone have the material take off on this? i.e. 4 sheets 3/4" ply, 2 sheets 1/4" ply, etc. Trying to put some costs together. Thanks! BEST ANSWER: The materials needed to build a Full or Queen Vertical murphy bed can be found at any large home improvement retail store and will total approximately $400. These materials will include four 4x8 foot sheets of veneered plywood, two sheets of inexpensive 1/4-inch thick plywood, 65 feet of solid wood, 80 feet of veneer tape, screws, and nails. You can use any mattress that is UP TO 12 inches thick (including any pillow top) and weighs between 50 and 65 pounds for the Full and between 65 and 80 pounds for the Queen. 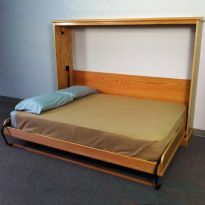 You can call the C.A.B., Inc/Create-A-Bed - the manufacturer - toll-free with any questions or for Technical Assistance. We spent close to $200 at Home Depot buying cabinet-grade plywood and the other wood needed for a full-size bed. We had all the tools, drill bits, screws and other materials. We went back to buy paint. 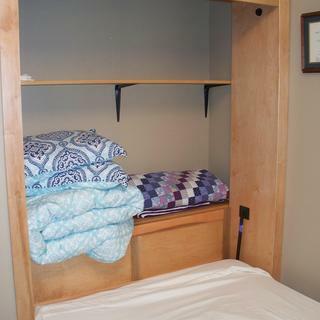 The materials needed to build a Full or Queen Vertical murphy bed can be found at any large home improvement retail store and will total approximately $400. These materials will include four 4x8 foot sheets of veneered plywood, two sheets of inexpensive 1/4-inch thick plywood, 65 feet of solid wood, 80 feet of veneer tape, screws, and nails. The comprehensive Bill of Materials is included in the construction booklet. You can use any mattress that is UP TO 12 inches thick (including any pillow top) and weighs between 50 and 65 pounds for the Full and between 65 and 80 pounds for the Queen. You can call the manufacturer with any questions or for Technical Assistance. Down load the plans fro the Rockler site it has a complete parts list. This includes the bed and side cabinets. Does anyone have experience with putting memory foam mattress into their Murphy? I have read that Memory Foam will compress when left in the upright position for long periods. I have not done it but, have toyed with the idea. Ours is a Queen size and works very well. I wondered about the loss of weight which might impact the balance of the air pistons. The weight of the mattress does offset the pull of the air pistons. Love to know if you try it. Does the kit for twin work for twin XL? I'm assuming it's the same, only I add five inches to the length of the box. 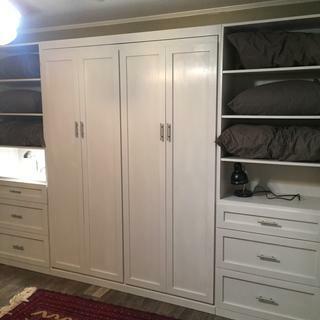 BEST ANSWER: You can build a TWIN-Extra-Long murphy bed by purchasing a TWIN Vertical or a Horizontal Create-A-Bed murphy bed mechanism here at Rockler and then contacting Create-A-Bed/C.A.B., Inc - the manufacturer - tool-free to request the TWIN Extra-Long plans. They are NOT included with the regular TWIN mechanism kits and must be requested. I would assume the same thing. I used a standard size so I don't know for sure. Are all 3 kits the same with the exception of the plans that come with the kit? Reason I ask, I am not sure it a queen will fit, and i want to get it ordered and on it ways. Please advise. BEST ANSWER: No they are NOT the same. They use different gas cylinders to raise the bed. The Create-A-Bed Deluxe Kit mechanisms ARE NOT ALL THE SAME. They use different strengths of pistons/gas spring lifts and different mechanism mounting positions to gain the correct amount of lifting power for that specific size (twin, full or queen) and style (vertical or horizontal) of murphy bed. Is it absolutely necessary to build the cabinets or can you just build the bed? BEST ANSWER: No it is not necessary you can just build the bed. You can just build the bed. 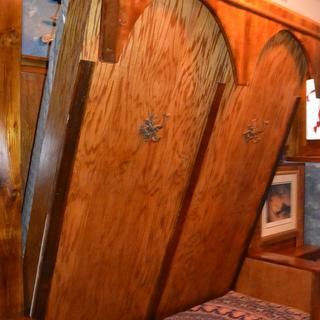 If needed you could easily fasten the vertical sides of the bed enclosure to the wall for extra support. Side cabinets are not necessary other than to store pillows, which must be removed prior to closing. You can just build the bed. Or just build cabinets. Each unit is separate from the others. on the kit with the metal legs, will the legs fold properly over a thicker mattress, assuming modifications are made to wood framing? BEST ANSWER: Yes, you can use a thicker mattress IF the mattress does not weigh more than the recommended window of weight for the size of the bed. 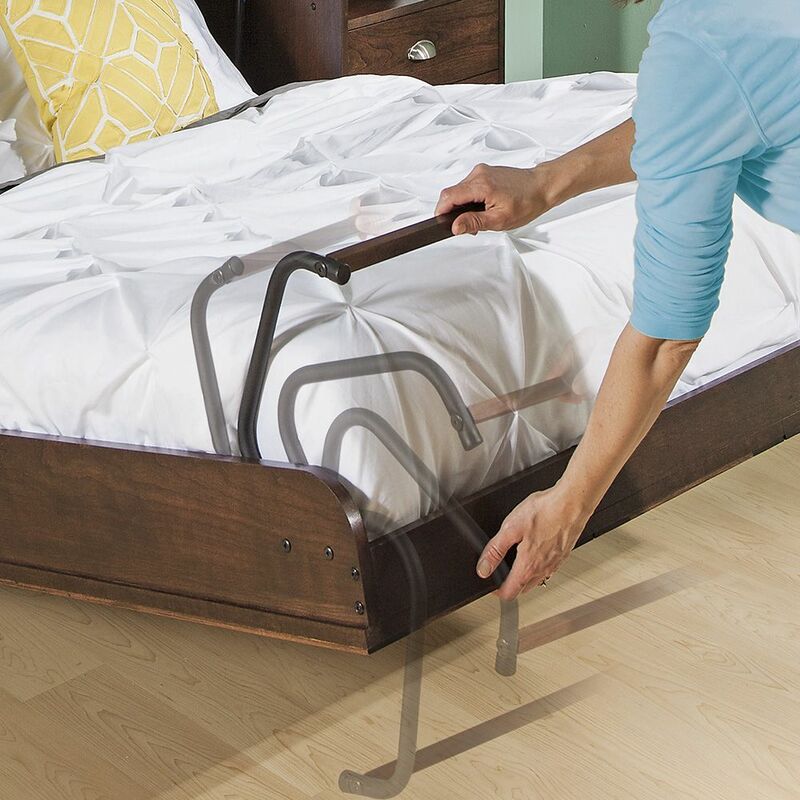 The Deluxe Create-A-Bed Murphy Bed Kit calls for a wooden Leg Support Rail that is connected to the legs and acts as a "handle" to rotate the metal tube legs from inside the cabinet over the end of the bed Face Panel Assembly when the bed is lowered for use. If you use a mattress that is thicker than 12 inches, you should ADD DEPTH to the bed cabinet and ELIMINATE the wooden Leg Support Rail. This means that you must be sure to fully rotate BOTH LEGS over the end of the bed Face Panel Assembly. If you call C.A.B, Inc., we can tell you exactly how to modify your cabinet to accommodate your thicker mattress. 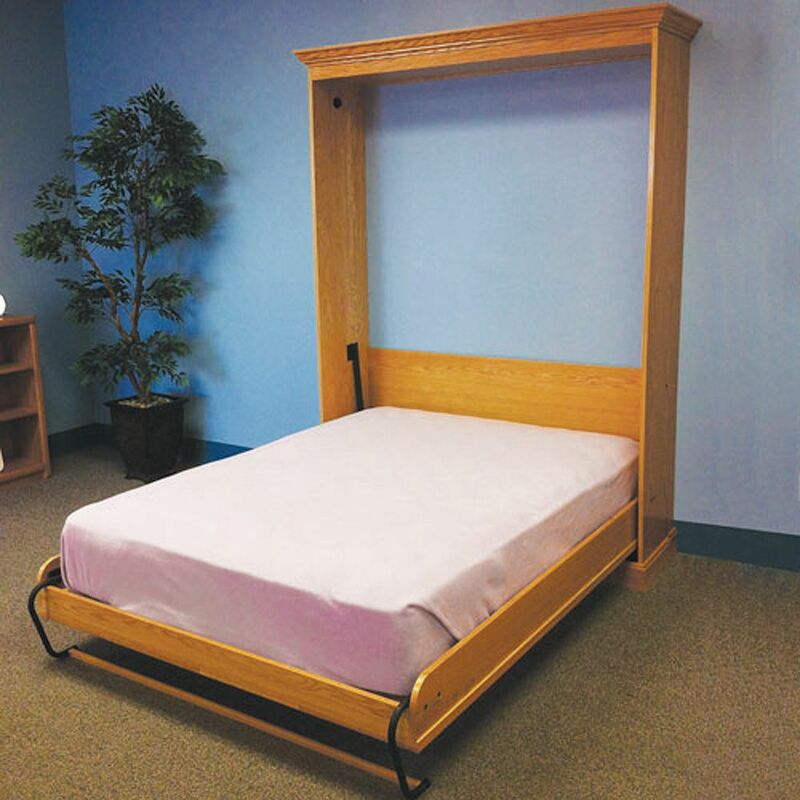 The Deluxe Create-A-Bed Murphy Bed Kit calls for a wooden Leg Support Rail that is connected to the legs and acts as a "handle" to rotate the metal tube legs from inside the cabinet over the end of the bed Face Panel Assembly when the bed is lowered for use. If you use a mattress that is thicker than 12 inches, you should ADD DEPTH to the bed cabinet and ELIMINATE the wooden Leg Support Rail. This means that you must be sure to fully rotate BOTH LEGS over the end of the bed Face Panel Assembly. If you call C.A.B, Inc., we can tell you exactly how to modify your cabinet to accommodate your thicker mattress. Yes, I've made two beds and both have mattresses with the pillowtop feature so it makes them thicker . . . single-sided though. There's enough room for pillowtop on both sides if you wanted it. And, I would not modify the side frame. Good luck. Yes, it worked for us. 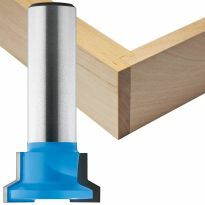 Can i use an 18g or 16g pneumatic nailer instead of hammering in finish nails? BEST ANSWER: Most definitely. I found that there are several ways to the end result on this bed. In no way does a pneumatic nailer affect the out come. Other then speed and efficiency. The main thing is using plywood, NOT mdf or solid wood on the side rails. It is a matter of strength and weight. It is all out line in the comprehensive instructions and dvd that comes in the hardware package. Yes, as long as you can take the right size brad/nail and adjust the pressure and depth. This is an excellent plan and the hardware is high quality. I would recommend it to anyone. I guess it would be okay, although nailers have a tendency to hit a knot or a hard grain and the nail sometimes shoots out the side. I have to twin beds that I need to buy the Murphy bed hardware for. Do you have a download for the twin like you have for the full & queen. Or does this information come with the hardware kit that will include all the material list and size of the cuts of all the wood for twin bed? all the information as far as cut lists and materials needed is in the instruction packet included in the kit. it all went together easily,even though I modified it to fit my customer's needs. How can I get another copy of the instruction video? I ended up packing it during our move and it is in the middle of a storage unit. BEST ANSWER: C.A.B., Inc./ Create-A-Bed will be happy to mail replacement copies of your instruction books or email PDF files of them at your request if you call us toll-free. C.A.B., Inc. / Create-A-Bed will be happy to mail you a replacement DVD or email you an online link of the entire video if you call us toll-free. Contact createabed and they will send you a digital copy. 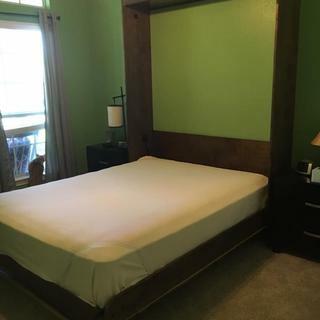 For a vertical bed I want to minimize how long it extends into the room. The plan shows 87" for a queen size bed. Can I reduce that length since the mattress is only 80"? BEST ANSWER: I don't believe that it would be possible. The pivot point is such that the bed nearly touches the wall when upright, and swings out very little away from the wall. There is almost an inch between the top of the mattress and the end of the bed support, so you really only have 6 "spare" inches. Suggest that you either look at a double bed, or at the Side Mount version which comes into the room much less. I will be building a side mound for a second room for this very reason. The "workings" of the bed hardware are located between the mattress and headboard, and considering what the workings accomplish, you should be extremely satisfied in that they only take up 6 inches or so. A simple answer is NO. I have a memory foam mattress which is a bit heavier than traditional inner spring mattresses and doesn't maintain its shape as well. Will this murphy bed design work for my mattress? It's hard to weigh since it is so bulky/deformable, but I'd guess the queen size is about 130-140 lbs. 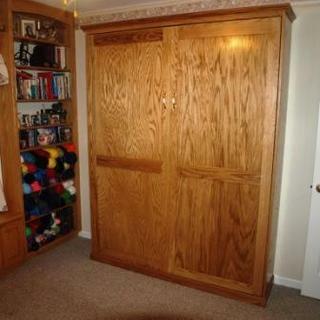 BEST ANSWER: I enjoy having the Murphy bed since it frees up valuable space and very accessable when needed. 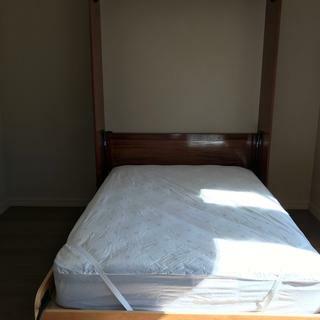 The mattress I used ,from another bed is quite heavy, I dont have the weight ,but takes a little more effort than shown in the video. Would probably invest in a lighter mattress if its used frequently. HI Mike , my name is Jerry , I have built 2 beds and my answer would be NO . The book states that a mattress should weigh more than 50 pounds and not exceed 55 1/2 x80 " in size . It might be hard for you to open and close the bed . Can the Side Rails be solid wood? The plans strongly say "must be plywood" why is this? Is this a weight issue? BEST ANSWER: I wouldn't use solid wood. There is a LOT of torque on that part of the side where the cylinder attaches. Solid wood could split over time. Use plywood and edge it with some 1/4"x3/4" solid wood. You could use solid wood at the foot. It is not a weight issue. I would not consider using solid wood for the side rails. 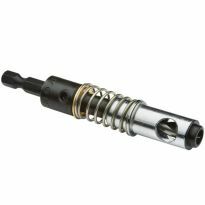 There is a great deal of tension between the gas rods where they attach. Plywood is called for because if it's a superior strength compared to solid wood. 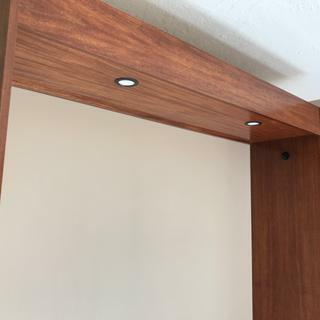 Solid wood will not be as strong as plywood and the folks at Create A Bed (manufactures hardware and supplies plans for this murphy bed) say if you use anything other than 3/4" plywood, IT VOIDS THE WARRANTY. 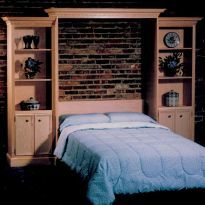 What are the differences between the Murphy bed hardware, and the Murphy bed deluxe hardware kits? I don't know what the difference is between the kits. How does the mattress attach to the bed frame? BEST ANSWER: Elastic straps at the bottom two corners of the mattress in its down position. Ends up being the top two corners while it the up/storage position. Elastic straps that are installed at foot end of the bed and they do come with the kit. They work perfectly on our Queen size mattress. BEST ANSWER: I actually did this. I used the queen package to build a king-sized bed. I had to recalculate all the dimensions, and had to select a very light-weight, relatively thin foam mattress to make it work. One caution - the king sized bed pan will not fit through any normal household doorways, so you are going to be building the bed pan in the room where the bed will be located, and the bed will never leave that room. I think the width would work, however the real question is the total weight. You definetly do not want to go over the weight limit for safety issues.